There is an automatic shut-off that will turn the sound off during the night. 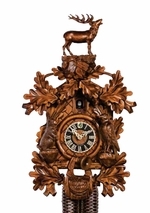 This clock is hand made in Germany by Sternreiter. There is an automatic shut off switch that will turn the sound off when it is dark.